The boat ultimately arrived in Philadelphia. It docked there because the crates into which the phoenixes were packed do not conform to containerized standard dimensions. There are very few ports left in the country that can deal with non-containerized sea cargo. Those crates then had to clear customs. 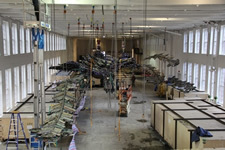 MASS MoCA employed a shipping broker to expedite that process. We also hired a trucking company based in New Jersey, which seemed to take its time making its way to MASS MoCA. (I put that as politely as I can.) When something like that--on top of shipping issues and even weather issues--is outside of your control, the frustration really builds up. Once we finally got the art here and started to wrangle with the various components, it was incredibly hard work and a challenge and a test, but that was welcomed after a protracted period of frustration. The whole story includes a "slow" boat, the Panama Canal, trucks, cranes, huge crates squeezed through doors, chains, and instructions translated from Chinese. I saw the Phoenix exhibit in January and it is truly amazing. I'd love to see it at night because there are many tiny lights in each sculpture. Mass MOCA is only an hour from Albany. We are fortunate to have this world class museum in our area.